The Permanent Fix for BMWs "Oil Pump Problem"
Ever have an oil pump sprocket retaining nut back off and lose oil pressure? How about shearing off the oil pump shaft with the sprocket and nut still attached? While this is rarer on the Euro M3 engine than the M50 family engines, it still happens. Chances are you will wipe out the engine, requiring a teardown or rebuild. We hear this happening to unsuspecting BMW enthusiast who track there Euro engines and don't believe it can effect them. 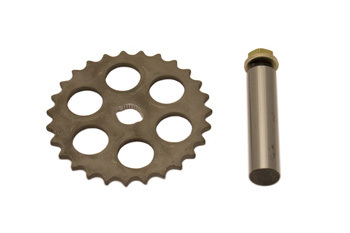 This kit is very popular for a reason: it eliminates all failure modes that the oil pumps see permanently!... while retaining serviceability. Some people believe it is enough to weld the OEM bolt on, or use a special nut and/or safety wire, however in these cases this does not solve the shearing of the shaft (completely off!) and in some cases can make things worse. This oil pump issue effects both 100% stock and modified motors that see high RPM use. Do NOT be the victim this common failure if you race or track your S50! Kit install is simple but requires a press.